If you’ve never heard of Amirah Ali before, let us be the first to introduce you to the college freshman from Voorhees, N.J.
Ali is the reigning National Soccer Coaches Association of America (NSCAA) national girls’ soccer player of the year, named in January after scoring 99 goals and 53 assists over her high school career at Eastern Regional High School. That capped a high school career in which she was named an All-American three times. 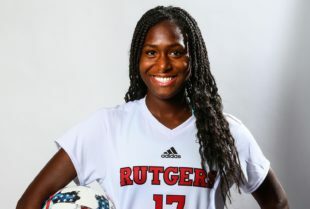 She was named Big Ten Freshman of the Year this year after recording five goals and four assists for a Rutgers University team that gave up the fewest goals per game in the nation. She also made third team all-conference as she helped Rutgers make the NCAA tournament this year. And she’s a U.S. youth international. She scored in her first collegiate game. She started every game this season for Rutgers. When you look at her numbers, consider that Rutgers was a team that stressed defense first (and with a top goalkeeper like Casey Murphy, the only goalkeeper on the Hermann Trophy semifinal list, why not). And yes, Ali is just a college freshman, so she’s just getting started. Yes, she can flat out play. Yes, we may see her at a much higher level one day. And yes, she’s worth paying attention to. It’s not often that we see one person take multiple PSP annual awards, but this time, it was pretty clear cut. Amirah Ali isn’t just PSP’s Amateur Player of the Year. She’s also PSP’s Woman’s Soccer Player of the Year. Get her a Union contract. Awesome write-up for an inspirational player. When we hear her name in the world cup…gonna dig up this article for friends and family.